HUDDLING together in the white icy blustery winds of an Arctic storm and in temperatures of -50 its hard to fathom that any living creature would be able to survive for any length of time imaginable. HOWEVER – Warm and cuddled together the Aptenodytes forsteri makes a case of happy feet and Arctic traffic jams just to keep warm look like a breeze in the northern winds. Welcome to the Arctic Emperor Penguin a mysterious but cute and cuddly penguin. FOR most, the start stop motion of a traffic-jam is about as infuriating as it can get., but if you are a group of emperor penguins, its just what you need to stay together. 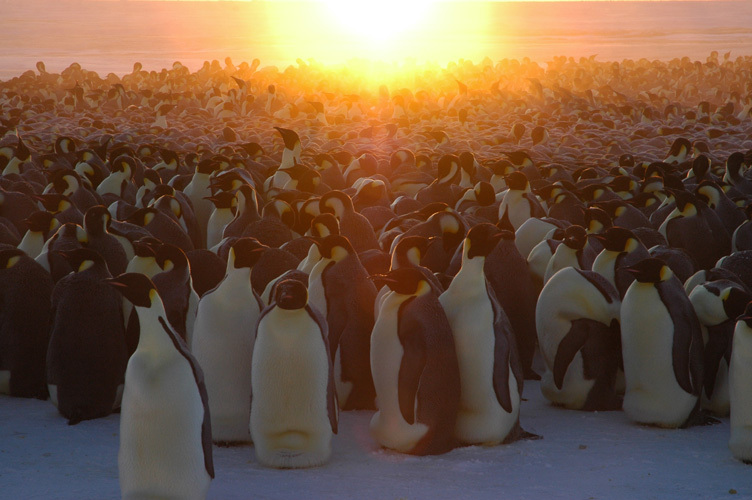 Emperor penguins huddle together in large groups to survive the Antarctic winter. Researchers interested in how these groups remain closely knit have attached temperature and light sensors to individual birds, but no one had looked at the dynamics of a huddle as a whole. To see what was gong on Dr Wegener Institute for Polar and Marine Research in Bremerhaven, Germany, filmed huddles and analysed each penguins movements. They found that when one bird steps, it triggers the coordinated movement of its neighbors in a wave-like motion, similar to the ways cars inch forward in a congestion jam. To find out what triggers these waves, the team applied a mathematical model often used to study and analyse road traffic congestion. It showed rather than simply being caused by cold penguins pushing in, waves can originate from birds at many different spots in the huddle., as long as their steps exceed a 2 centimeter threshold distance, about twice the thickness of their feather layer. Waves that started in two different groups can merge, helping smaller huddles grow into large throngs that can withstand a shockingly low temperature of up to -50 oc. 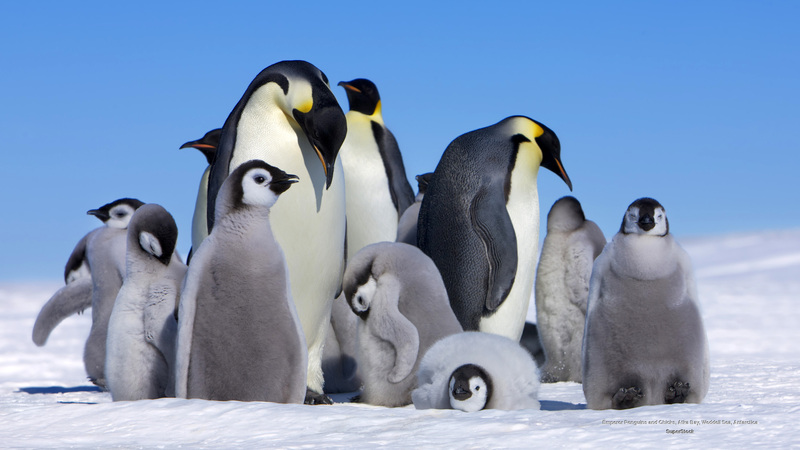 Emperor Penguins are the largest species of Penguin listed as least concern on the IUCN red list of threatened species. They measure up to 1.1 m (3.5 ft) in height and they weigh up to 37 kgs (82 lbs). Their head and wings are black in colour, their back is blue-black and they are coloured white on their front. They have yellow patches on the side of their neck and their bill is purplish-pink. The feathers of Emperor Penguins are thick, and provide insulation and a waterproof layer over their whole body, except their feet and undersides of their wings. Male Emperor Penguins have an abdominal fold between their legs and lower abdomen that is known as their “brood pouch”. This protects their egg and chick during the breeding season. Emperor Penguins swim at speeds of 6 – 9 Km/hr (4 – 6 mph) but they can reach speeds of 19 km/hr (12 mph) in short bursts. The call of each Emperor Penguin is distinct and males and females can be identified by their differing calls. On land they alternate between walking and “tobogganing” along on their stomachs, propelling themselves with their feet and wings. To protect themselves against the cold, severe weather Emperor Penguins huddle together in what is known as the “turtle formation”. The huddles can consist of 10 or hundreds of birds and each bird leans forward on a neighbour. Those on the outside shuffle slowly around the edge producing a churning action that gives each bird a turn in the middle. Emperor Penguins can dive up to 530 m (1,750 ft) for as long as 20 minutes – they hold the record for the deepest and longest dive from a bird. It was believed that the endangered Spheniscus demersus – African penguin held this record however this is false, they are though one of the fastest penguin swimmers in the oceans to date. Emperor Penguins are the 5th heaviest bird currently in existence and are the only penguins to breed during the winter months and they endure very severe breeding conditions. In the 2006 film Happy Feet, the main character was an Emperor Penguin called Mumble and he befriended a group of cuban-accented Adelie Penguins. Emperor Penguins belong to the genus Aptenodytes, which also includes: – King Penguin – Aptenodytes patagonicus. Alternatively visit our Marine Conservation Society Organisation here. This entry was posted on December 19, 2013 by speakupforthevoiceless. It was filed under You must be the change you want to see in the world .